During grilling season, “How do you want it cooked?” is one of the most common questions asked in back yards across America. Living up to someone’s idea of the ‘perfect’ steak can be a grill master’s biggest challenge – but don’t worry. We’re here to help. 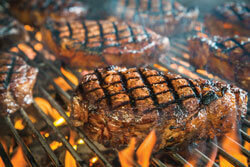 Length of grill time affects steak quality and tenderness. Some like it hot – and some prefer rare or medium-rare. We all have a preference and it’s up to you, as the grill master, to get it right. When it comes to doneness, seeing is believing. Use this chart to grill great steaks, every time. Marbling is an insurance policy for tender, juicy beef every time. ‘Marbling’ refers to the little white flecks of fat within the lean beef. They melt during cooking and baste beef from within for amazing flavour. 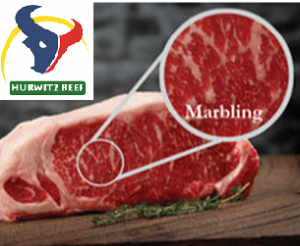 The Hurwitz Beef brand offers abundant marbling in every cut. It’s one of the reasons the brand is so consistently flavoruful, tender and juicy. Before your next back yard barbecue, buy the best beef available and please everyone at the party.